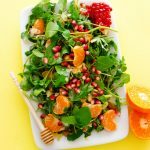 This Citrus Watercress Salad is a simple, summery combination of clementines, pomegranate, and leafy greens, tossed in a cinnamon yogurt dressing. For full instructions, head over to B&W Quality Growers, the sponsor of this recipe! Recipe from Live Eat Learn at https://www.liveeatlearn.com/citrus-watercress-salad/.